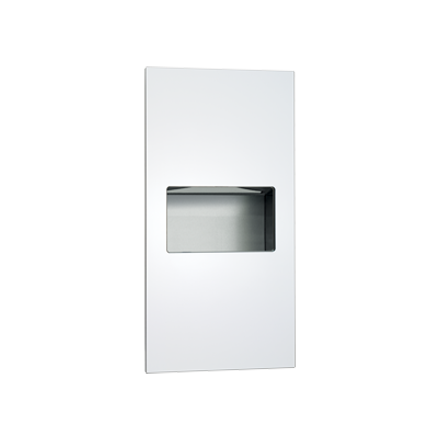 This sophisticated paper towel dispenser and waste receptacle cabinet is designed to be completely recessed into the plane of the washroom wall, highlighting the seamless design that defines Piatto™. The phenolic door is attached to the cabinet using field-adjustable, furniture quality hinges and is secured shut by an internal spring-loaded latch. All hardware is concealed giving the Piatto™ Collection its minimalist appeal. Well-suited for the smaller washroom with less space and traffic, this unit dispenses 350 C-fold or 475 multi-fold paper towels. Towels are self-feeding until supply is depleted. Unit will continue to feed properly when reloaded with a partial load in place. Includes 2.2 gal. (8.4 L) stainless steel waste receptacle, which is emptied manually.